Let’s talk edges! Edges don’t neatly fit into the usual categories of painting instruction- drawing, value, composition, color, technique. They are about all those things and much more! As a result, the topic of edges is often given short shrift , or when it is discussed, it isn’t fully integrated into the “big picture”. First, what’s an edge? Quite simply, an edge is where two shapes meet. This might be two objects in a still life set up, objects in the foreground of a landscape set off against the distance, or a tree top against the sky. All of these present opportunities to paint edges, and the way we paint them will affect a great many things in our picture. You will often hear that your sharpest edges should be found at the center of interest. Although this is a generally helpful thing to remember, it doesn’t mean you will use a “1”. Just like with value, you use a range of edges. If, like me, you tend to use softer and lost edges, then your “hardest” edge might be a 4 or 5. So how do edges affect all aspects of the painting process? In drawing, the kind of edge we use will provide variety as well as place emphasis on particular parts of our drawing. It works the same way in painting. Edges can also help you move the eye of the viewer through the painting. So they are a consideration in composing. Hard edges create contrast and that draws attention. Manipulating the value or color along an edge can make one form dissolve into another, create a sharp contrast, or introduce a color gradation or vibration. A crisp strong brushstroke can create an edge all by itself, while a glaze or scumble can obscure one. Edges are the place that all you know about drawing, value, color, composition and technique come together! Here are some examples. 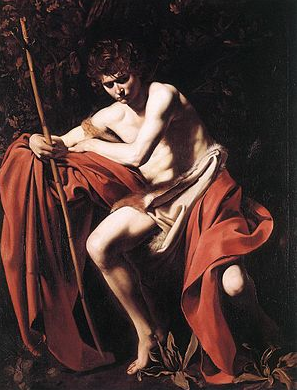 Obviously this isn’t a landscape, but when I saw this painting a few years ago, one of the first things that struck me about it (aside from its size and the dark, brooding face of St. John,) was how masterfully Caravaggio used edges to bring the viewer in and around the painting. Of course, some of the sharpest edges can be found in the shoulder which brings it forward and gives the figure great volume and power and the left edge of the face (drawing). On the other hand, the top of the head becomes lost in the mass of foliage behind, and the shadowed side of the face melts into the neck and shoulder while the firmer edges in the arm and knee create a powerful diagonal leading to the face(composition). Caravaggio orchestrated a masterful repertoire of edges to create this powerful sculptural image. Look further and see where you can identify firmer, softer and lost edges. 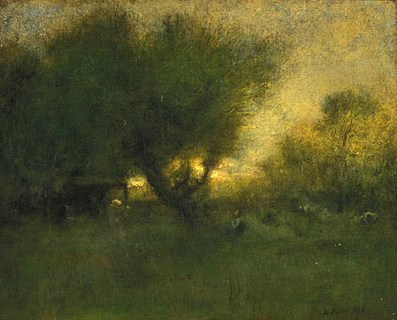 ￼In this moody Tonalist landscape by American master George Inness (1825-1894) the artist has used mostly soft edges. This adds to the atmospheric quality of the work. But, he uses some slightly firmer edges around the tree trunks to accent those negative shapes of light sky behind (drawing) and draw the eye through (composition). He has used layers of glaze and scumbles to achieve a luminous glow and to soften most of the edges in the painting (technique). ￼ Here is a beautiful Sanford Gifford. Gifford ( 19th century American- Hudson River School/Luminist) is known for his luminous atmospheric works. You can see how he has created lost edges in the clouds and edges of the mountain with a firmer edge along the demarcation of light and shadow defining the shape of Mt Ranier (drawing, value, color). 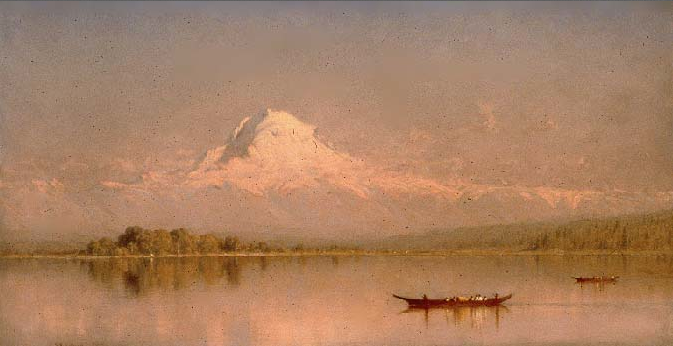 The little boat and figure in the water have much crisper edges and act as a design counterpoint to the mountain top (composition). 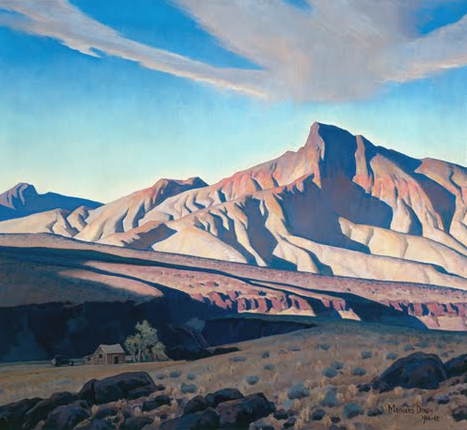 This painting is by Maynard Dixon (20th century American). Dixon’s paintings of the Southwest depict its arid landscape which produces harder edges which clearly define the sculptural shapes of the landscape (drawing). He manages to work within a range of hard to firm edges with a few softer edges reserved for the sky and clouds (value, color). P.S. What’s the one thing most beginning and intermediate landscape painters could do to immediately to improve their work? Improve their drawing skills! Our six week online class Drawing the Landscape is designed to do just that. It starts March 27. Join us!